Pumpkin Fine Cars & Exotics' Car of the Day...a 2006 BMW 325i, 4-Door Sedan. 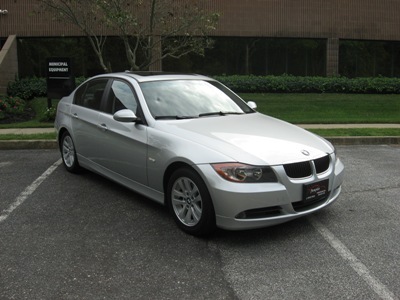 This PRISTINE, Silver on Black Leather, 3-Series Beamer is a GREAT BUY! With a CLEAN & PERFECT CARFAX History Report, TONS OF LUXURY OPTIONS and ONLY 54k original miles, you can OWN IT TODAY for $17,995. You'll SAVE THOUSANDS over the MSRP and get a QUALITY Vehicle that's been FULLY SERVICED and PUMPKIN CERTIFIED. CONTACT US at (609)646-7676 or by email at [email protected]. Owner Franck Freon hand-selects each and every vehicle the bears the Pumpkin name, so you can rest assure that you are getting the MOST RELIABLE, BEST PRICED vehicle your money can buy! This ONE-OWNER 325i comes equipped with a 6-cylinder, 3.0 liter engine and a 6-Speed MANUAL TRANSMISSION. PREMIUM & COLD WEATHER PACKAGES, POWER/HEATED SEATS with Power LUMBAR Adjustment, Alloy Wheels, MP3 Input, CD Player.... WHAT'S NOT TO LOVE?!?! Need financing?! ?...We have that too! Come in for a NO PRESSURE test drive today! Visit us on the web at http://www.pumpkincars.com/ for a complete list of our pre-owned vehicles and for any additional information. 10 Year Anniversary of Historic Win at Daytona!